I felt utterly compelled to start this thread because there are some performances in life, that transcend all conventions of mind and logic. The reason I am initiating this thread is because I am overcome with joy listening to this particular track below and I just have to share it with you guys. PLEASE DO NOT STREAM IT, unless it is a lossless format. No MP3, no Youtube...your first exposure of this instrument has be be lossless at the very least! Else, you will lose out on the subtle tones and overtones this instrument creates. Mike_WI, Lyer25, danishchelsea and 2 others like this. Ha, I was just about to start this thread! Okay, well, I'll contribute with some introductory, tldr-type material with links and such. Afterwards, I'll make recording recommendations from my collection. There are two basic types of Indian classical. The southern style, called Carnatic, is someone I'll leave to other folks (such as KOTH GANESH OR THAD...or I'll do it later). The Northern style, Hindustani, is the one I'll be focusing on. Hindustani music is the one most people are familiar with outside of India, thanks to Ravi Shankar. Interestingly, harmony is only incidental in Indian classical music, so melody and rhythm have really been worked out in intricate ways. Melody: The most important thing in Indian classical music is the Raga. A raga is, poetically, that which colors the mind. In Hindustani music, a raga often has different ascending and descending scales (which can be 5, 6, or 7 notes), there is always a key note to be emphasized (the vadi) and a second most important note (the samvadi). In complex ragas, some notes can only be reached from another note or only touched on in the upper octave, etc. And there are microtones, with some notes being defined in a microtonal interval. Ragas have feelings or moods associated with them (the rasa, the nine classical rasa include devotion, joy, love, pathos and heroism) and usually ragas have a few of these which must be evoked. There are also times of day associated with different ragas, from meditative pre-dawn ragas (raga asavari, bairagi) to sad and heroic morning ragas (the Todi family of ragas), to holy crap it's too hot out noontime ragas (raga sarang), to romantic evening ragas (raga rageshwari and kafi), etc. This is from the excellent, Raga Guide, which I recommend. The Alap is a fully improvised, free rhythm exposition of the raga. It's where the lead musician has the most scope to really show you what they can do. Lasting from a few minutes to an hour, the alap tends to move from lower octaves to higher and from slower to faster. In a full instrumental performance, the alap proper transitions into a jor section where a pulse is introduced and finally a jhalla, where rapid strokes on secondary strings lead to a shimmering effect. Now we start again, but this time there is both the raga and also a rhythmic cycle, called a tala, played by the lead musician and now joined by a percussionist, usually playing tabla. The compositions (called a gat or bandish) are little two verse melodies that help define the raga and give a home base for improvisation. This part of the performance is a little like a rondo in western classical music, sorta. Usually, the tabla player holds the skeleton (theka) of the tala, until the lead musician plays the composition over and over (which fits in the tala perfectly so you can hear where they are in the cycle) and this gives the percussionist a chance to play his own compositions for a little while. Talas are rhythmic cycles and they have their own intricacies, but the key point is the first beat of the cycle, called the sam. When the lead or accompanying players improvise, they both must end on the sam! No matter whether they improvise for one cycle or 10 cycles of the tala, it all ends at the sam of the next cycle after. The most common is the 16 beat tintal, divided 4/4/4/4. There is also the 12 beat ektal, the stumpy 10 beat jhaptal and the folk tala dadra in 6 beats. There are many others as well, but those are the most common. Here's an old school VHS recording of Ali Akbar Khan playing his sarod. He's playing a gat in an evening raga, zila kafi and the great tabla player Swapan Chaudhuri is accompanying. Jerry, Lyer25, danishchelsea and 4 others like this. I can talk a little about Dhrupad, the oldest and most austere form of North Indian classical music. Start with some classic CDs by the Dagar Brothers. The Dagar family has preserved Dhrupad for generations and lent its name to a style of Dhrupad (dagavani). Dhrupad has a long, long alap. It's a real meditation on sound and the raga (nada yoga). The alap proceeds into a nomtom alap (like a jor and jhalla) and gains intensity. Finally, there is a composition, accompanied by a special drum called a pakhawaj, which is like the father of the modern tabla. 60 minutes of alap for 10-15 min composition is common. I've seen this on mp3, so look around. Raga Kamboji is a very typical Dagar raga, only they and their students sing it. Jecklin Disco has a recording of the Dagar brothers singing Raga Miyan Ki Todi and it's very worth tracking down. Alakalahiri refers to rhythmic vocal ornamentation and some dope thought that was the title of the "song", I guess. These three have the excellent pakhawaj player Mohan Shyam Sharma, whom I studied with briefly. He's so good. You can get these in mp3. The CD liner notes are good, but not $50 good. It's the very popular midnight raga Malkauns with the famous courtly evening raga darbari kanara (or kannada, as they have it here). Good stuff. There are so the Dagar students, the Gundecha brothers (yeah, it's a lot of bros in Dhrupad). The Gundecha brothers are still alive and they are very, very good. They are so a bit tech savvy, so their recordings tend to be excellent as well have being at a high level of musicianship. Their take on Dagarvani Dhrupad is very smooth. Buy anything from them and you'll get something which is representative of them. In terms of Dhrupad instrumental, Zia Mohiuddin Dagar was amazing on the rudra vina. Long, long, long, slow, slow, slow going deeeeeep into what a raga is. it's like hearing a whale sing--if the whale was a great musician. Develop a long attention span and get into this music. This is the classic alap-only 2 CD set, no pakhawaj, but long alaps with a lot of depth. Asad Ali Khan played a different style of rudra veena if you want to get a sense of that. There is a lot to say and recommend on instrumental Indian classical recordings generally. With a music like this, sometimes it all comes together and you get a great performance. I would start with The Signature Series--remasters of classic Ali Akbar Khan (one of the greatest instrumentalists of all time) records from the 60s. He was at his height then and every one of these is fantastic. He is often playing ragas of his own invention. They are pretty great. Vol 4, which has light ragas played by Ali Akbar Khan and the great sitarist Nikhil Bannerjee (many CDs by him are phenomenal) in duet is considered a classic and a good introduction to Indian classical. danishchelsea, Thad E Ginathom, Abhishek Chowdhary and 1 other person like this. Wow Kunlun....I am speechless! Looking forward to your guidance in this thread. Hey, I'm glad you like my posts here! Okay, let's look at some suggestions to start an North Indian Classical music collection of great performances. We started with Ali Akbar Khan, the son of the guy who trained Ravi Shankar (who married Ali Akbar Khan's sister) as well as Nikhil Banerjee. Those Signature Series CDs are a good, but there's quite a bit more. Hmm, we can go by instrument, maybe, even though going by school (gharana = style/school) makes sense, too. Sarod first. What an awesome fretless lute. Okay, we have Ali Akbar Khan. Next is Amjad Ali Khan, who comes from a different stylistic tradition. A pro musician once played a recording of Amjad Ali Khan when he was 17. After a few minutes, the musician looked at me and shrugged. "He was always that good", he said. Yeah, he's really a great musician. Totally fantastic and Zakir brings his magic, of course. There's also a "Tribute to Mother Teresa" CD (uh, can't really comment on the name of the cd, but ignore that because it's a great, great live performance). Raga Rageshri, a romantic raga and it's Amjad and Zakir playing fantastically and intensely. It's a laid back performance done very well. I recommend it. I should say that Indian Archive Music has some of the best liner notes. The essays for Vilayat Khan's CDs under the label are worth the cost of the CD, plus you get an incredible performance, more on Vilayat later. The Bairagi Bhairav is a diamond of a performance. Perfection. The longer raga lalit (a sunrise raga with a slightly unsettled meditative air) is super. Buddhadev Das Gupta (and also his son anirban das gupta) has yet another stylistic tradition and he's very good, too. Banjo-ish sarod. Sitar. Yeah, there's so much great stuff here. Ravi Shankar, go with his early stuff. Buy this. Gangeshwari, Rangeshwari, and Kameshwari are 3 Ravi Shankar created ragas and his performances with Zakir Hussain's father Alla Rakha, are incredible. Vilayat Khan. The greatest instrumentalist of any style of music of all time. Seriously, in human history, there was a guy who invented the reed flute 50,000 years ago who's a close second. "He's like a god" <----what a professional Indian classical musician said of Vilayat Khan to me. Even if you decide you don't like his music, which is an objectively wrong thing to think, he, personally, changed the course of Indian classical music. Maybe I'll talk about it sometime. Another classic early recording that every Indian classical music fan should have. Buy this for the liner notes and music that actually represents post-raga music at the close of Vilayat Khan's life. A long, slow romantic journey. So, yeah, Vilayat has his own tradition, naturally, of which he was the 7th generation, iirc. He changed it all and his son Shujaat Khan carries it on. Perfection from a younger Shujaat Khan. A great musician and a nice person. This CD is a perfect introduction to Indian Classical Music. From Liner notes to the way Shujaat takes us through an encyclopedia of techniques in the form of a beautiful performance. Back to Ali Akbar Khan/Ravi Shankar's style. Nikhil Banerjee was a child prodigy and Ali Akbar's father taught him differently than his son or Ravi Shankar. The result is a style full of feeling. My favorite younger sitarist is Anupama Bhagwat, she has a CD called Ether which is excellent. First, guitar. Why? Debashish Bhattacharya is why. HE'S SO AMAZING LISTEN TO HIM NOW! He modified the crap out of his guitar and he plays it slack-key slide guitar style with miraculous technique. and everything else he's done, some crossover stuff, too. Vishwa Mohan Bhatt is a senior Indian classical guitar player and he's very good as well. Okay: Now, Bansuri, bamboo flute. Hari Prasad Chaurasia is your man. A lot of beautiful improvisations unwound throughout. On to Sarangi. This instrument was dying for a number of reasons which are all dumb and can be traced to the British. Ram Narayan single-handedly brought it back and it's being taught and played again. This is a good thing because this is a bowed, viola like instrument which has lots of sympathetic strings and has a beautiful, haunting sound. A long performance that goes deep into this meditative, yet unsettled raga and has a number of heights to it. His daughter plays sarangi as well. An easier to approach performance. Oh, santoor, (or santur). Shiv Kumar Sharma put it on the concert stage and he's really excellent. Very good performance, but then, everything he does is good. He and Zakir are buddies and play well together. There's a CD on moment records of Rageshwari which is very nice of the two of them. Seriously, though, you can really buy anything of ShivKumar Sharma and you'll hear some quality and accessible Indian classical music. I could have recommended him for a person's first Indian Classical CDs. Very easy to enjoy him. And Shenai, played at Indian weddings, traditionally. It's dying out a bit. Bismullah Khan was like a saint and a fantastic musician of this whiny, drone-y oboe swarm like instrument. 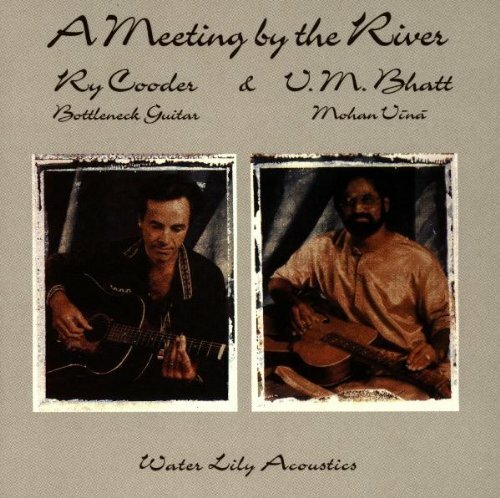 Here's a classic with Bismullah and Vilayat Khan (who was an alcoholic at that time until his second wife dried him out). Vilayat is smashed on this recording and he's incredible. Plays right over Bismullah sometimes, though. Bismullah was very sweet person and they are great on this recording. That should be a good start on this thread. solarflight, Wilson, danishchelsea and 3 others like this. Thank you so SO much for these posts. Gaurav, is this thread relegated to Hindustani only or can it include Carnatic? All forms of Indian Classical. Carnatic as well....this thread would serve perfectly for folks seeking more depth of knowledge, including myself. I'm actually very excited to see how this thread develops. If the first few posts are any point of reference, I will be eternally indebted to this group for their thoughts and experiences. Many thanks for these posts. I am from India but do not have even quarter of the knowledge that you posted. I didn't write about Carnatic, because that's ALL YOU (AND THAD)!!! Seriously, I could have said something, but you guys know that music, I expect some great performances/recordings recommendations at the very least! Well, I gave Thad enough time . I don't think I can match Kunlun's awesome post but I find that this one website is just downright awesome and comprehensive in giving one a complete education on Carnatic musiuc. This website traces the origins of this style of music, going back to the "Holy Trinity " - Thyagaraja, Syama Sastri and Muthuswamy Dikshitar. Please note that the underlying focus of this style of music is devotion to a personal God. In Thyagaraja's case, it was Rama. Syama focused exclusively on the Mother Goddess, and so on. I was fortunate to listen to Carnatic music due to my mother who was proficient both in the music and in Bharatanatyam dancing. She was part of a group that used to perform regularly for Jawaharlal Nehru, India's first Prime Minister whenever he came to Chennai (our home town). Chennai is a very unique town for music. Every December-January (for 30 days based on the Tamil month of Marghazi), the whole town plays host to Carnatic musicians and Indian classical dancers. Thad attends these things much more regularly than I do. Going forward I will provide links on very good performances. shaizada and Kunlun like this. i saw Ravi Shankar years ago at the old Guthrie Theater in Mpls. i was only a few rows away. one of my most cherished musical experiences. This is a great album. Some of the finest songs from Indian cabret/funk scene. I'm kinda bored with the normal stuff I've heard, but does anyone have recommendation of collaborations or subgenres in the same vein as Philip Glass? Well, it's not in the same vein at all, but here are two very done "fusion" records (I'll someone else recommend Remember Shakti, which you should also check out--I met a guy who contributed some melodies for them, pretty neat). I mentioned Vishwa Mohan Bhatt who plays slide guitar hinustani-style. This is completely fun and Water Lily Acoustics means it's the tops in terms of getting the sound recording right. 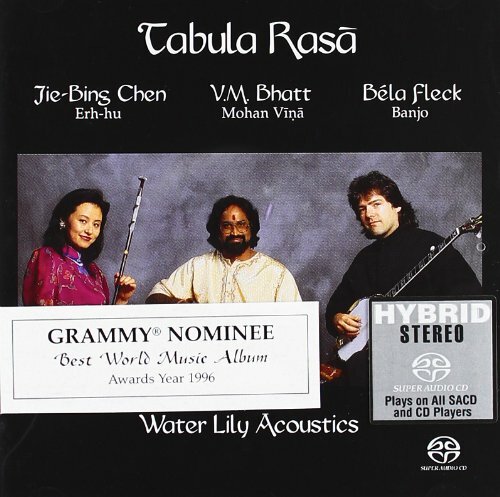 One of the tracks is an erhu and banjo duet called "Earl in Shanghai", how can you not love it? Very good music. On the Carnatic side, L. Subramaniam has done a number of spanish jazz fusion CDs, I haven't heard them, but maybe worth checking out. Also check out stuff from Indialucia. thanks for the fountain of knowledge guys. i ordered a few recordings recommended above. 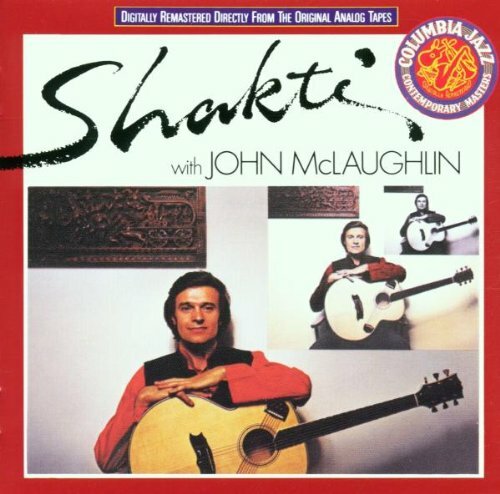 i really enjoy percussionist Trilok Gurtu on other John McLaughlin recordings and have been meaning to check out some of his other work. any recommendations?